J.R. wrote: How nice, Robert. In ten years, the use of Christian names appears. It was never heard of in the early 60's, APART FROM, Chris Read who joined staff around '62 and taught printing and other 'manual' crafts. Seconded. Typical of the man when you knew him better. He always offered encouragement which was not always the case at that time in my experience at CH. Incidentally, John, Chris Read, whom you refer to, is also in Bob's House photo above. I'm sure he wasn't a housemaster when he started teaching printing. Myself and Paul Coates did many 'extra' lessons with him in our last year, as we dropped out of several classes. Just the two of us did all the school programmes and school printing with him. He was fantastic - More like a fellow house-mate than a master. My first attempt at uploading a photo. The original is only 2x3, so the quality is not good. The names are copies from a pencilled notation on the back, often not clear so there may be misspellings. It says 1955, but it cannot be earlier than 1957. House photos were taken in the summer, and in summer 1955, many of those in the picture (in my year or below) had not yet arrived. Also, the housemaster of MaA until at least July 1956 was not Barker, but Tod. michael scuffil wrote: It says 1955, but it cannot be earlier than 1957. House photos were taken in the summer, and in summer 1955, many of those in the picture (in my year or below) had not yet arrived. Also, the housemaster of MaA until at least July 1956 was not Barker, but Tod. Error 404 (Not found). Pity. This is Maine B 1993. Recently retired housemaster harryH in the center. 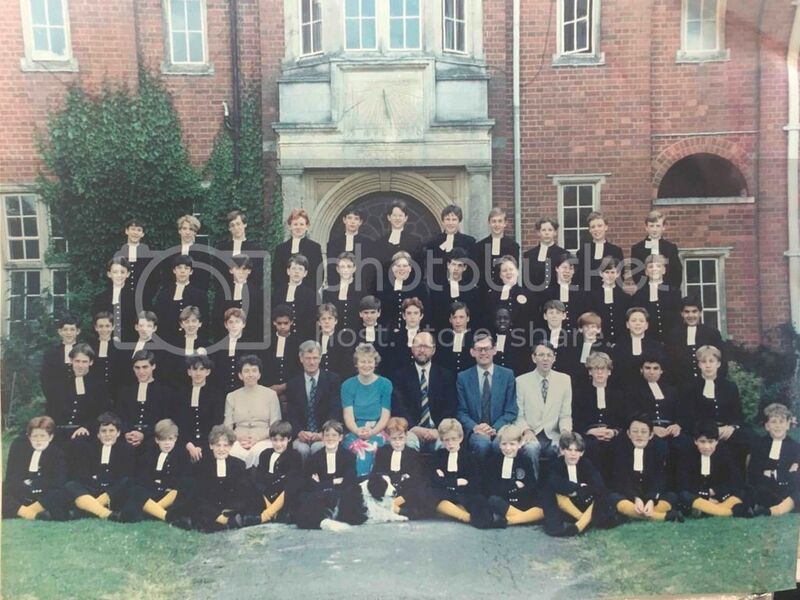 I'm in the row behind him, just to the left, right behind Mrs H. I'll let others identify themselves, if they wish but will note that the school's current head of Classics (and fives!) is front row, third from the right.